Since the sixties, some of the most popular and influential acts in pop and rock history have recorded at Paramount Studios, but Adam Beilenson and Mike Kerns -- owners of the facility since 1987 -- prefer to focus on the present and future. Ice Cube, DJ Danger Mouse, Macy Gray, Ruben Studdard and Fantasia, Nelly Furtado, Pink, Linkin Park, Liz Phair, The Neptunes, to name a few. And yet, all the name-dropping would be of no value if they didn't have a world-class seven-studio facility that grew with the times and featured state-of-the-art equipment. 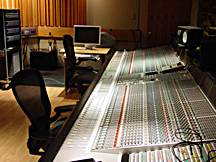 Studio C, which has an 80-input SSL 9000J series console. "This room is our real centerpiece, with its classic Hidley design and incredible ambiance," says Beilenson. 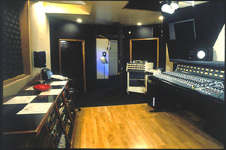 40x40 live room and three additional recording booths, plus a private lounge and upstairs bedroom and bathroom. Much of what you hear on the radio these days is mixed on the 9000J, but it is also regarded by top engineers as an excellent tracking board." 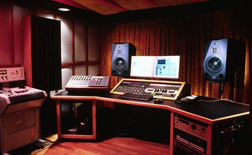 Paramount also boasts three other rooms with impressive equipment specifications, plus a Sonic Solutions-based digital mastering studio (Studio E). 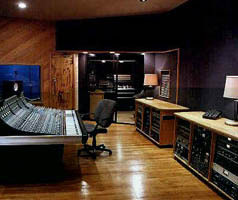 Studio A has an SSL G console, B has an SSL E/G, and D functions as a ProTools preproduction room. 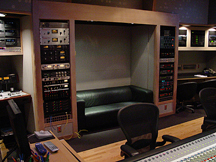 All of the studios have a similar outboard gear package (including most notably Avelon, Neve, GML, Pultec and Manley) as well as ProTools, 2" tape and ADat capabilities and tube mics by AKG, Sony, Neumann and Telefunken. 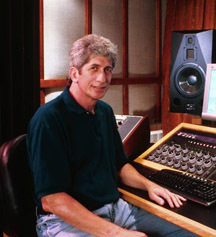 The facility takes pride in offering a handful of top engineers and technical staff including Bill Dooley, who has been involved in mastering since being the chief recording engineer at Atlantic Recording Studios in New York City. He also built and operated CD mastering facilities at the former A&M Recording Studios and the former Brooklyn/Extasy Recording Studios. Dooley's mastering credits cover all musical styles including pop, rock, hip hop, R&B, country, jazz and new age. Featured artists include work with the Chaka Khan, Deftones, Motley Crue, Judas Priest, Madonna, Crosby Stills and Nash, Reba McIntrye, Guru as well as hundreds of independent releases. "We're very excited to have Bill join our team at Paramount," said Kerns. "Bill brings a wealth of talent, knowledge and experience to Paramount Mastering." Studio E features a SOntec mastering EQ and Manley compressor to add an analog ouch to the mastering process. Thirdstone Studios (above and right) were acquired by Paramount in September of 2004. 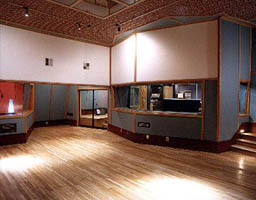 Originally built in 1981 by George Tobin and known as Studio Sound Recording, this North Hollywood facility boasts three Jack Edwards- designed studios. 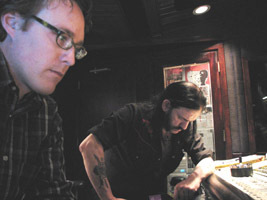 Producer Cameron Webb (Social Distortion, Motorhead, Silverstein, Over It) above-- with Lemmy, bassist & vocalist of Motorhead, at Paramount Studio A hard at work and listening to slabs of sheer volume on their mixes off the studio's SSL 6000 series console. "We reach a lot of high-profile clientele, but some top producers need to bring in new artists to develop," Beilenson says. "Studios B and D are designed by more project oriented where artists can experiment. Our job is to keep them happy in the studio environment." In 2000, Beilenson and Kerns expanded to the Valley, buying the two-room Ameraycan Studios in the NoHo Arts District from Ray Parker, Jr. and completely renovating it. 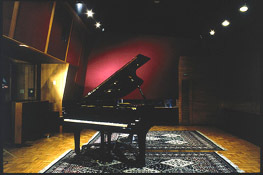 Studio A features a 72-input G-Plus console with a live room and a Yamaha C-7 grand piano, and B has an 80-input SSL G Plus (with Ultimation). 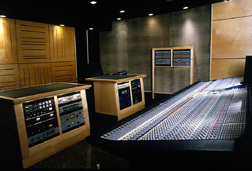 In a short time this facility has become an incredible hotbed for a variety of hit artists. ...We put a lot back into the studio and are always keeping up with acquiring both vintage gear as well as the newest in recording technology. People know what they can expect here and they trust our collective technical expertise. The Studio really speaks for Itself, " says Beilenson. "As former musicians ourselves, we completely empathize with everyone's need to have a place like this," Beilenson adds. "The great pleasure for Mike and I is that, once we realized that we weren't going to be among the lucky ones who become pop stars, we found a way to work in the music business and with some of the most incredible talent around."